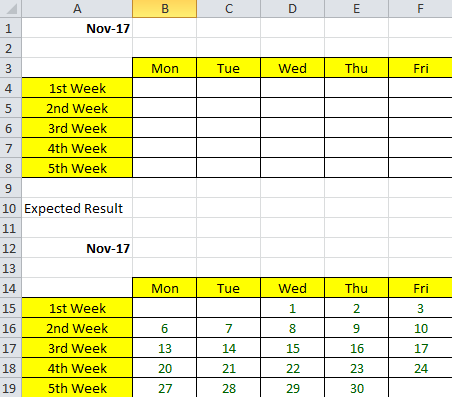 So, if A1 = 1 Nov 2017, the excel should auto-populate a calendar in Nov 17; same if A1 = 1 Dec 2017, the excel should auto-populate a calendar in Dec 17, and so forth. Is that possible by using pure Excel formula? I don't need a complex solution here. Then use =B15+7 in B16 and copied across and down to F19. =OR(B15<$A$1,B15>EOMONTH($A$1,0)) and apply format of white text. I will upload a sample shortly. Please find the attached with one simple approach. Remember that the columns B and H are hidden. Thank you both, very nice solutions! You're welcome Trowa! Glad we could help.